Imagine a group of children (4–10 years old) gathered on a field of grass or by a shade tree. 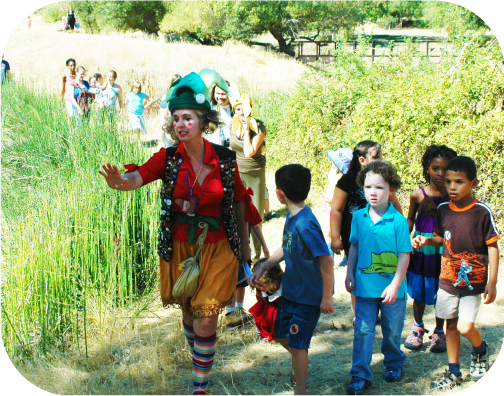 A costumed character enters, sets up a Nature story, and takes the kids on a quest full of learning, games and adventure. The stories have a very simple plot and costumes can be as basic as wearing a colored sheet as a cape and adding a mask. It’s all in the book: How to Run an Outing, Group Management, Costume and Prop ideas/checklists and more. It’s easy to run a Nature’s Theater outing. Even teens enjoy their experience leading a group of younger kids through a story—it gives them a sense of meaning and accomplishment. You can lead a very special outing for your kids. An outing kids remember for a long time. It’s called Nature’s Theater.